Download the Full Conservation Blueprint here. Explore the interactive atlas here. With increasing pressure on scarce natural resources, the Land Trust for Santa Barbara County finds it critical that we develop the tools that we need to better understand our changing county landscape and to inform decisions about these resources. More than two years ago, the Land Trust began a partnership with the Santa Barbara Foundation and the Cachuma Resource Conservation District to create an inventory of the natural resources and community values about land in Santa Barbara County. 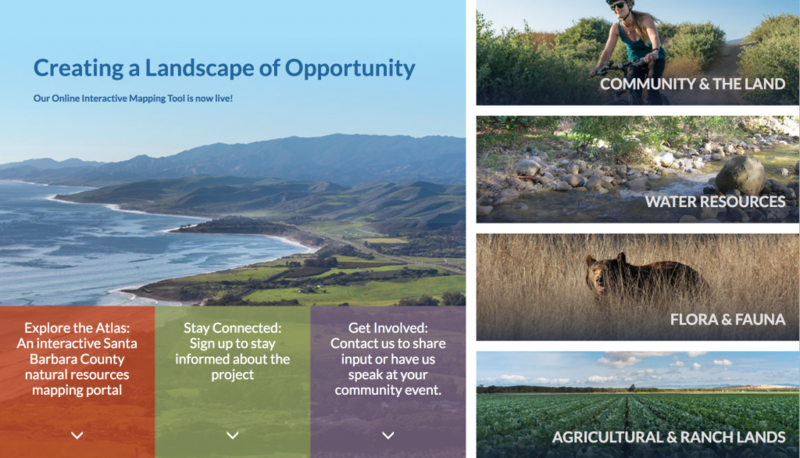 Now complete, the Santa Barbara County Conservation Blueprint report and online, interactive atlas are available to the public. With these tools, everyone can learn more about the region’s natural resources and make informed decisions about our shared future. The Blueprint process has created a roadmap and the lesson the Land Trust and partners have learned will serve as a blueprint for conservation for decades to come! With the data and mapping technology developed by the Blueprint, the Land Trust will identify the places throughout the county with the most important wildlife and plant habitat, productive farm and ranch lands, areas of scenic significance, and the places where the community needs room to play. Keeping agricultural lands and rangelands in production is one of the most effective long-term conservation measures. Habitat fragmentation is a significant threat to the long-term viability of both agriculture and habitat for plants and animals. Santa Barbara County communities are committed to conserving both the long-term future of natural lands and the economic viability of farm and ranch lands. Balancing housing needs and conservation needs is critical to moving forward. Conservation is a central part of the Santa Barbara economy: 12% of local jobs are held in restoration, conservation, recreation, and tourism. Another 10% of county jobs are connected with local agriculture. Preparing and managing for a changing climate will build a more resilient Santa Barbara County. As a result of this effort, the Land Trust is now developing a proactive and strategic approach to land conservation that focuses on promoting and enhancing biodiversity, ecosystem interactions and resiliency to climate change by protecting agriculture, habitat, and open space—and is, most importantly, informed by community input. We believe feedback from the community will reaffirm much of our work, but also expose new ideas and conservation opportunities. Build a strategic plan based on the lessons learned from the Blueprint process. Create unique, individual conservation strategies for each important property and landowner. Address the needs of the community. Leverage various funding sources for purchasing conservation easements. Sustain an increased pace of conservation. Santa Barbara County is a special place with unmatched scenery, a remarkable diversity of plants and animals, and productive ranching and agricultural lands – all of which contribute to our economy and quality of life. County residents and landowners have been good stewards of these resources with a long history of effective land management and conservation. Yet with increasing population pressure on scarce natural resources, along with the new realities of climate change, it is critical that we develop the tools we need to better understand our landscape. We must also begin to think together about how we can address the pressures we face to create a more resilient and adaptable future for us all. The purpose of the Blueprint is to provide a common language and platform for publicly available data to support in depth conversations and informed decisions about the Santa Barbara County landscape. The Interactive Atlas – Now Live! The Atlas is an online mapping portal where community members can view, retrieve, and analyze information about land use and natural resources in Santa Barbara County. The Atlas is designed to make science-based spatial data from many sources easily accessible. 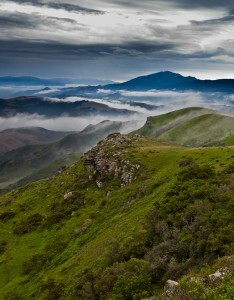 Data and information relevant to land and resource conservation in Santa Barbara County. A series of five galleries for different topics relevant to the Santa Barbara geography. These galleries contain a selection of data layers representing each theme: water resources, agricultural and ranch lands, flora and fauna, climate, and recreation and tourism. Mapping tools to visualize and overlay the various layers within the Atlas. The ability to browse and search our ever-expanding GIS Data Inventory with over 200 different data layers identified. The ability to add groups for further collaborative data sharing and map development.